That Winston Churchill was a pretty interesting guy. You've heard of him, right? Maybe? The man who was the 61st (and 63rd) Prime Minister of the United Kingdom with fifty plus years of experience in government prior, wrote over fifty books and won the Nobel Prize for literature in 1953, painted over five hundred paintings with exhibitions at the Royal Academy, and defied to be defined by societal lines, flip-flopping between political parties twice. Yeah, you know-that one you thought you knew well enough, but are now feeling you barely knew anything about. Don't worry, I felt the same way heading into Darkest Hour thinking I had it all figured out. And while I did to a certain degree with the prominent director recovering from a flop with rather safe material as made prominent by a well-regarded actor going full method and fully into prosthetics to play a historical figure of note in an attempt to, if nothing else, check another challenge off his thespian bucket list, what I hadn't figured out was the unexpected layers to be brought to such a character. Churchill is a man we've seen on so many pages of our history books over the years and who, with his recognizable silhouette and famous markers such as the bowler cap and cigar, is more or less embedded into the consciousness of generations who go through public school leaving us this very surface-level and mild idea of a man who many will desire to leave at that and delve no further into. To undo the myth around the man, but emphasize his influence all the more director Joe Wright (Atonement, Hanna) and screenwriter Anthony McCarten (The Theory of Everything) make their film more in line with something akin to Lincoln than they do a full cradle to grave biopic which, ultimately, is suitable and more compelling given the plethora of material and other motion pictures that are available around the famous figure (heck, there was another movie just this year about Churchill starring Brian Cox in the title role). As Darkest Hour zeroes in on these crucial days during World War II and the Prime Minister's decision to either negotiate with Hitler or fight on against incredible odds the film itself finds a comfortable rhythm that it remains within; offering what is an insightful and often times compelling portrait of this man that is just different and specific enough to feel relevant while crafted with enough care to be commendable if not necessarily wholly impressionable. Winston Churchill (Gary Oldman) works with new secretary, Elizabeth (Lily James) to put together his speeches. An extraneous factor Focus Features, Wright, nor anyone else in the production might have had control over is the fact that four to five months prior to their film opening there was a little movie called Dunkirk that opened and that kind of serves as the story of this conflict told from the perspective of the soldiers on the beach whereas Darkest Hour tells of the perspective from those making the decisions that would determine the chances of the characters in the former's survival. Fortunately, these films paths rarely cross in terms of ideas and/or content, but the companionship of them and more, the well-rounded picture produced by having seen both within a short time period is an interesting angle to take and one worth noting if you've not already seen Christopher Nolan's near masterwork and plan on seeing this. Told over the course of only twenty-six days Darkest Hour begins on May 10, 1940 with the resignation of Neville Chamberlain (Ronald Pickup) with whom, following failure in Norway, the United Kingdom had no confidence in with regards to his prosecution of the war and thus forcing him to resign. The commonly accepted version of events states that Lord Halifax (Stephen Dillane) turned down the post of prime minister because he believed he could not govern effectively as a member of the House of Lords instead of the House of Commons. Although the prime minister does not traditionally advise the King on the former's successor, Chamberlain wanted someone who would command the support of all three major parties in the House of Commons which, by default, was Churchill. 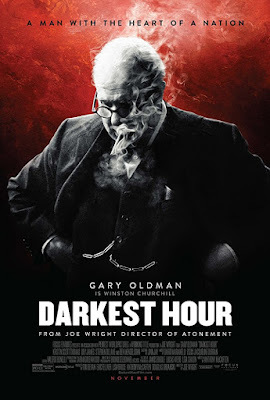 In this way, Darkest Hour is the story of how Churchill went from a derided outsider to saving the world from that of a tyrannical dictator who others saw compromising with as an option. This change of power that comes to be defined by the sometimes reckless, but often time's well calibrated attitude of Churchill is what defines the tone of the film. There is a lot of people yelling back and forth at one another in seemingly eloquent patterns of speech while the point to be taken from all of it is much the same in that Churchill doesn't come to meet any one parties political needs or wants, but rather that he is here to whip the country into shape and to do whatever it takes in order to defend their island from the Nazi scourge that are on the precipice of conquering the entirety of Western Europe in the few days after he is appointed his new position. And so, what does Darkest Hour do to differentiate itself from the horde of other content that has been produced around this greatly revered historical figure? Well, that would of course be to attempt to humanize the man as much as possible. This is done through numerous fashions as McCarten introduces us not only to Churchill's wife, Clementine (Kristin Scott Thomas), but to a new typist that is brought in at the top of the film to capture Churchill's speeches and serve as his secretary in the form of Elizabeth Layton (Lily James). Layton is meant to serve as this kind of surrogate for the audience into the bowels of Churchill's day to day in dealing with each blow Britain's army is taking as well as to serve as this exemplary marker as to where Churchill begins and how his arc comes to shift across this particular narrative based on their relationship. There are a few touching, even genuinely human moments that come about as a result of this dynamic and James is as charming as she can be in a role that is little more than that of a tool to display said change, but does a figure such as Churchill necessarily need to have an arc in a movie that covers only twenty-six days of his life? Aren't the actions he took and the courage it took to make those actions happen captivating and development enough to justify the goal of this particular story? One would think, but it seems McCarten's intention here is not simply to document the events of this tense time period in Churchill's existence, but rather to examine how the common man might come to relate to this giant; how to shrink Churchill down to a more manageable size as it were. How does one do this with a man who is in fact uncommon though as is documented through the multiple achievements noted in the first paragraph. Early in the film itself, Oldman's Churchill asks himself, "Which self should I be today?" as he gazes upon the numerous hats that hang on the wall of his home making it clear the man is well-aware of his facade-the persona most assume he represents-and having to decide which of these identities will be appropriate for the discussions taking place that day. Strangely enough, McCarten enters the character then through feelings of self-doubt and angst over these decisions he has to make. We see Churchill as a loving husband and celebrated father, but it is Thomas and her portrayal of this counterpart in the life of Churchill that serve the story McCarten is more interested in telling better than the route of the conflicted and indecisive emotions the writer decided to employ. As her husband's equal and something of his backbone, Clementine humanizes this larger-than-life historical figure more so than tearing down the single quality he was most revered for-his resolve. Churchill comes to be celebrated by the House of Parliament for his bold and controversial decisions. Obviously, none of us alive today were present in Churchill's chambers when he was deciding what to do or how to go about dealing with the pressures from Chamberlain and Halifax to discuss the possibilities of peace, but to question as much-to question that Churchill ever wavered from doing whatever it takes for victory is to seemingly undo all that history has tried to build up since World War II entered those books. And maybe this is fair, maybe this is the point McCarten wanted to highlight, and that allowed Wright a way into the film-by making Churchill a more relatable guy, but it seems to do the opposite of what they thought it could do for their film. To add this layer of indecision and insecurity would seemingly amp up the drama of the piece given the context of the days surrounding those in which Darkest Hour documents, but rather the film tends to plod along from speech to contemplation to another speech all to come to the same conclusions becoming repetitive instead of compelling. Of course, what does make Darkest Hour compelling is that of Oldman's much discussed performance. The man is buried in make-up and is barely recognizable and yet he turns in what is undoubtedly the most performancy performance of the year as we come to see that human side McCarten was so intent on capturing though not through his actions in the political arena, but rather in the small moments outside of them where we deal not in the man who has to lead, but in the man who is formulating plans as to how he will carry out his leadership. 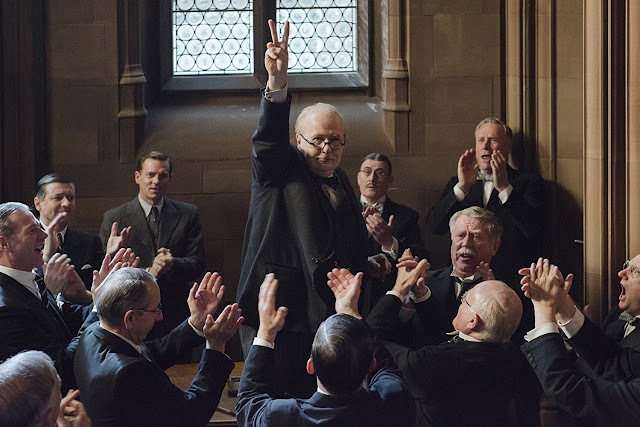 The moments where Churchill is writing and delivering his speech simultaneously as James' character stylistically captures them and better learns to read her new employer's disposition is fantastic as is any scene in which Oldman and Thomas are allowed to bounce off one another to reveal genuine humanity and a loving relationship between the characters without devolving into re-writing those aforementioned history books. I won't pretend to be overly bothered by McCarten's choices as I'm by no means a Churchill historian or expert, but Darkest Hour in its effort to deconstruct the controversial choices Churchill had to make and fight for ends up only painting a rather straightforward picture of unquestionable good guys and unquestionable bad guys that plays out as we know it will. 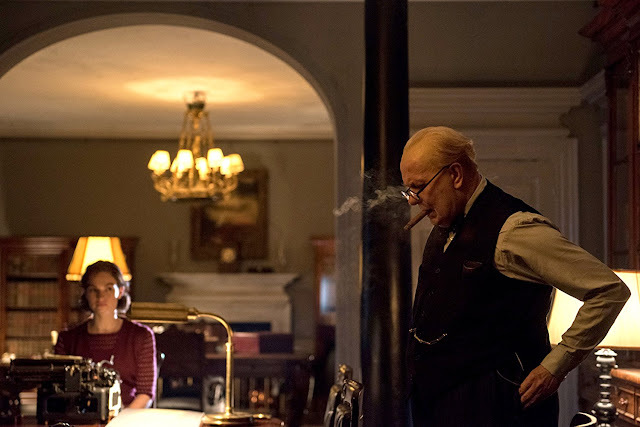 Still, Darkest Hour is strengthened by Oldman's showing and his strong supporting cast (Ben Mendelsohn as King George VI is solid and shouldn't go without mentioning) as well as Wright's stylized eye that makes the film not necessarily about the scope of this new role in the landscape of Churchill's life, but more how he comes to deal with this role at this crucial juncture in history when it was thrust upon him out of circumstances beyond his control, but in his favor.